ABOVE: Most Parisian cashpoints have menus in at least four languages, including English. Obtaining cash and using credit cards are easy in Paris, but there are a few things you should know before you stick your wallet in your pocket and head for France. 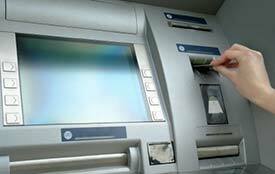 Your best source of cash is an automated teller machine (ATM) or cashpoint. You'll find ATMs on banks and post offices all over Paris, and most of them have step-by-step instructions in your choice of French, English, and other languages. You'll nearly always pay a small transaction fee on cash withdrawals outside your bank's ATM network. What you may not know is that many banks have foreign-exchange surcharges of up to 5 percent on overseas cash withdrawals. If your bank has such a policy, you may want to change banks. We advise carrying ATM cards for two different banks, just in case one of your cards doesn't work. Also, look for an ATM before you run out of cash, because it can be frustrating to encounter a "network link down" error message when you're wallet is empty. If you insist on exchanging cash or traveler's checks, try to limit the amount, because changing money back into your own currency at the end of your will mean yet another exchange commission. Visa and MasterCard are accepted by most shops and restaurants, though smaller merchants, some neighborhood restaurants or bars, and street vendors may not take credit cards. (Also, restaurant tips are normally given in cash.) American Express is accepted at higher-end boutiques and restaurants that cater to tourists. Some credit-card issuers decline foreign transactions unless you've notified the company of your travel plans ahead of time. It's a good idea to call the toll-free number on the back of your card before leaving home, just to make sure that your card will be honored while you're abroad. Top photo copyright © Roman Milert. Inset photo copyright © imagestock.